In an interview to three reporters of the Leading European Newspaper Association, Mrs. Lagarde stressed that besides a debt restructuring the Greek government would have to vote in and implement deep reforms for the fund to continue to back the program. “This would be feasible if significant reforms were legislated and implemented and if the debt was restructured in order for it to be consistent with the debt analysis”, she told the journalists, underlining that she had seen progress on reforms. 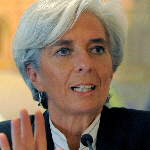 “It is our experience, expertise and discipline that the Europeans value mots after so many years”, she added commenting on the financial assistance the fund would bring to the table by its participation.The IMF head made it clear in her interview that the fund would not take part if a debt restructuring was not achieved. “If the Greek debt is not viable in accordance with the IMF’s regulations, and on the basis of set parameters we will not participate”, she pointed out. She added that the extent of the debt restructuring would be determined by the debt sustainability analysis. “There is no doubt on our mind that a degree of restructuring is necessary”, she said. Mrs. Lagarde also noted that the IMF believes a 1.5% primary surplus target is reasonable in the long run, given the state of the Greek economy and the ability of Greece to make reforms. “We cannot adopt absurd targets or build on an unjustifiable macroeconomic framework”, she said.